It's time to back up a little bit, to the beginning. The idea in creating this blog was to provide step by step guidance to those who would follow in our footsteps (as it were). As such, I'm going to back up a bit to step one. Actually, a bit before step one. The first thing one needs to do in this process is to assess what one is up for and what skills one has. If you don't like repairing things or working with tools and you don't want to learn, don't do this type of project. Not unless you have deep, DEEP pockets and don't care about money. You should like to learn and like to do projects. You should have some facility with tools and have a desire to gain some new expertise. You should love old homes and the history of them. You should have vision and creativity. You should be willing to do your homework. Frankly, this is a bit dated, but the concepts are sound and very hands on. I got a lot out of it. Don't be afraid to do lots of reading to determine what is in store for you if you do this project and how much you're up for. So, anyway, once you've established that doing a rehab is what you want to do and within the realm of possibility and financial responsibility, then you can move on to Step 1: Finding a Property. The first part is to decide where to look. 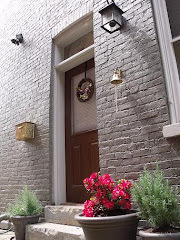 We chose the N.Ky Riviera because it wasn't Cincinnati, it was full of wonderful old brick homes, and was much more foot traffic friendly and all in all more like a real city with real neighborhoods. Of course, the N. Ky Riviera is several Cities (Dayton, Bellevue, Newport, Covington, and Ludlow), but you know what I mean. Once you've got a zone, there are some wonderful tools to help you. Indispensable is Google Maps. It really helps to be able to see the land around a property quickly. If you want off street parking, you can usually tell if such is possible with a quick search. Zillow.com is also useful in researching property values and trends, though I wouldn't rely upon those too heavily. You'll probably want to find a long suffering real estate agent and work through their listings that meet your criteria. Do them and yourself a favor and research the listings that you think are interesting before you call your agent. You'll be looking at a lot of homes and you don't want to waste his or her time. Google helps on that front as does a good real estate web site. We liked Sibcy Cline . Additionally, you'll want to get in touch with the housing department of whatever municipality you decide on. Often they will own several properties that they are eager to sell to motivated rehabbers. Sometimes, they'll have incentives for you as well; Tax abatement or grants or loans. Don't assume that any price for a property is set in stone, either. You'll also want to look up realty auctioneers. This can be a great way to find a real bargain. And, don't forget just driving around looking for "for sale" signs in neighborhoods that you're interested in. Do take your time. You're going to be making a pretty sizable investment in time and money and you don't want to rush things. Try to remain emotionally detached from the process. It took us 6 months or more to find a place and then another year to actually buy it. Believe it or not, we were ready to walk right up the the closing, if necessary. Remember, buying a house is very emotional. That can cloud your judgment or allow others to perhaps maneuver you into an inadvisable selection. Keep your cool, do your homework, and do your leg work. This tilts the odds in your favor. fantastic advice, great pix that show the process in all its *ahem* glory. As a real estate agent, do you mind if I throw in a bit more buying advice: You obviously found an agent who was as excited about the prospect of finding you the perfect rehab project as you were- that's so crucial. I would suggest to anyone looking to do this with an agent, interview ruthlessly to find an agent who is really on board with your plans. Many would prefer not to show homes for 6-12 months, knowing that the buyers would walk at the closing table. You don't want to develop a working relationship and have it crumble because the agent did not understand or appreciate your needs. At any rate- best of luck with your continued progress, and thanks for sharing it online! I probably also should have noted that a Realtor isn't going to get paid much on a deal like this--since you're going to be buying a pretty cheap property. It might make sense to discuss some sort of retainer or other fee arrangement so that your poor Realtor doesn't get the short end of the stick, after showing you tons of funky properties. Yep, the ability to visualize what the house was like "in its day" reveals why most people pass on by, missing the long-term statisfaction of restoring an old gem.